The Mountain of Butterflies is the first Google Doodle of 2016, to mark the 41st anniversary of the discovery of a small area on a mountainside in Mexico where about one billion Monarch Butterflies (Danaus plexippus) come each year during the winter. How they all get there from as far as Canada is one of Nature’s great mysteries. 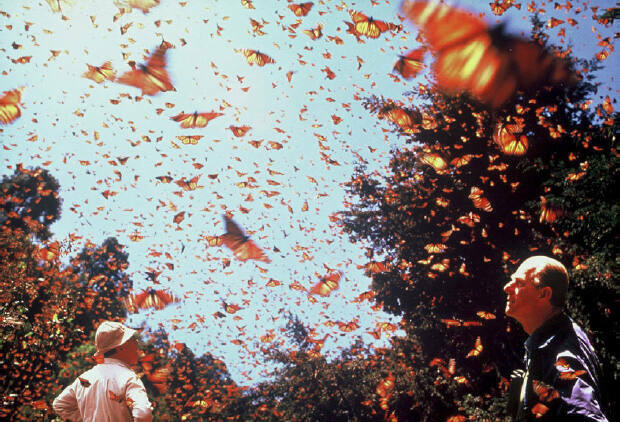 In 1975, forty-one years ago, after several decades of searches involving literally thousands of volunteers across the whole continent, American naturalist Ken Brugger (1918-1998) and his wife Catalina Trail unlocked one of the most beautiful and fascinating mysteries of nature – the place where the Monarch Butterfly migrates to every year. Led by a team of Canadian Zoologists, under Fred Urquhart (1911-2002), the husband and wife team followed clues left by tagged insects that had fallen or strayed on their migration southward from the northern parts of North America. Dr. Urguhart’s quest to find the route and destination of the Monarch Butterfly began in 1937 and lasted nearly four decades (37 years). He and his wife Norah Roden Urquhart (1918-2009) tracked the trails of the migrating butterflies by tagging the wings of thousands of them. The scene, in which approximately one billion Monarchs cling to the oyamel trees in the fir forests of central Mexico, must have been absolutely overwhelming. In Google’s homepage today, artist Kevin Laughlin recognises the 41st anniversary of an amazing discovery, and the singularly breathtaking beauty of the Monarch Butterfly. Details of the discovery were published in an article in National Geographic – ‘Discovered: The monarch’s Mexican haven’ – and featured a cover photograph of Catalina Trail covered in butterflies. Since then, about a dozen other similar sites have been discovered in Mexico. They are all protected as ecological reserves by the Mexican government. Today, the area is a World Heritage Site called the Monarch Butterfly Biosphere Reserve. Efforts are currently underway to protect the Monarch in Canada and US, where they breed. The Urquharts discovered that Monarchs only travel during daylight hours, and can fly up to 81 miles (130 km) each day. The migration north spans several generations of Monarchs, while a ‘super-generation’ flies from the northern areas of North America all the way to Mexico, where it spends the winter, then breeds in the spring to start the next generation flying northwards. The Monarch Butterfly Biosphere Reserve, which covers an area of 56,259 hectares, lies within the rugged forested mountains about 62 miles (100 km) northwest of Mexico City. According to UNESCO, every autumn about one billion butterflies from several areas of North America return to the site and gather on small areas of the forest reserve, literally decorating the trees with their orange, black and white colours. There are so many of them, all together, that the branches of the trees bend under their collective weight. In spring, the Monarchs begin an 8-month migration that takes them as far as Eastern Canada, and then back. During the trip northward and then back, four successive generations are born and die. Nobody knows how they find their way back to such a tiny area in Mexico – it is a miracle of nature. They seem to have a built-in compass that tells them which way to go every fall and spring. According to the Monarch Butterfly Biosphere Reserve, the overwintering concentration of so many butterflies in one small area is probably the most dramatic example of insect migration. Of the 14 overwintering colonies in the oyamel fir forests of central Mexico, the Biosphere Reserve protects eight of them, i.e. about 70% of all the butterflies that overwinter. The Monarch is probably the most recognised butterfly in North America. The species has been observed in New Zealand and Australia since 1871, where it is called ‘the wanderer’. It inhabits the islands of Madeira, the Azores and the Canary Islands. They are easy to identify – their wings have an orange and black pattern, and span 3.5 to 4 inches (8.9 to 10.2 cm). The males, which have a spot (androconium) in the middle of each rear wing, are slightly larger than females. Monarchs have different habitats during the warm and cold months. They are unable to survive in ice temperatures. From spring until early autumn, they can be found anywhere where there is milkweed in abundance. They are always looking out for these weeds in meadows, fields and parks, because that is where they lay their eggs. Like all butterflies, the Monarch’s diet changes as it grows up. It survives on milkweed plants only during its caterpillar stage. Adults get their nourishment from several types of flowers, as well as milkweed.